Description: The hoary bat is Florida's second-largest bat species. Its long thick fur includes a mix of colors including black, brown, yellow and cream. Most of the hairs are tipped with white, giving it a frosted appearance, from which it receives its common name. Because of its unusual fur, the hoary bat is likely one of the worlds most beautiful bats. Florida roosting preferences: Solitary. Roosts in tree foliage, tree cavities, behind loose bark and in Spanish moss. 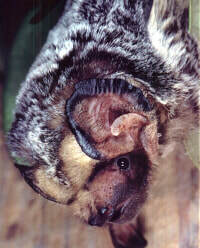 The multicolored, frosted fur of the hoary bat enables it to roost openly on tree trunks while camouflaged against the bark. Food preferences: Insectivorous. Feeds on moths, beetles, flies, mosquitoes, grasshoppers, dragonflies, wasps, flying termites, and other insects. Reproduction: Females usually give birth to two pups, but may give birth to one to four. Young are born from mid-May to early July. Florida range: Found in north and north-central Florida during the months of October through April.